GraphicConverter 10 from Lemke Software is the newest version of an old favorite graphics utility going back to 1992. What started out as a basic utility for converting image file formats from one type to another has expanded to a full-fledged image editor, photo browser, and, of course, image file format converter. GraphicConverter has grown over the years into both an extensive image editor and a must-have utility for anyone working with photos. But at its core, it's still the best utility to use for converting image file formats from one type to another. Of course, GraphicConverter handles more than just old, obscure formats. 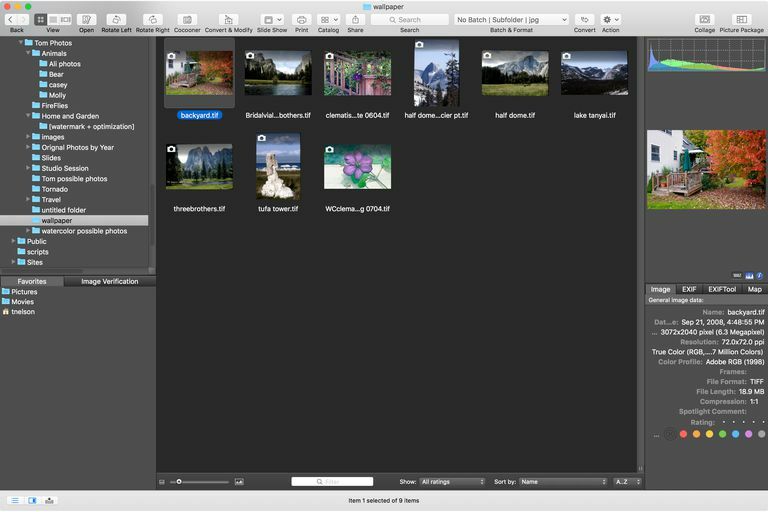 Because it exposes many of the options available in various graphics formats, you have more control over how you want to save your photos than with most other image editors. GraphicConverter isn't known as the Swiss Army Knife of graphics utilities for nothing; it has just about every feature and capability known in the graphics field. Shoehorning this vast feature set into a single app tends to highlight one of the few cons of this app: its somewhat jumbled user interface. You can also have both modes operating at once; open an image directly to the editor, and have the browser open to look through a folder. Because the editor and the browser aren't tied together but are two separate windows, you can use the two modes independently of each other. I prefer using the browser mode in GraphicConverter. The browser is divided into three panes, plus a toolbar across the top of the browser window. The left-hand pane contains the folder hierarchy that you're browsing, allowing you to quickly move around your Mac’s file system to work with images. There's also a Favorites area, which you can use to keep the folders you access most often just a click away. The center pane provides a thumbnail view of the contents of a selected folder. This may be many images but can also include folder and document icons. Clicking an image in the center pane opens the image in the GraphicConverter editor. The right-hand pane contains a large thumbnail of the selected image, along with various types of information about the image. This includes the usual file image you would see in the Finder’s Get Info view, as well as EXIF data and a map showing location information. You'll also find options to display an image's exposure histogram. You'll also find tools for directly manipulating an image, including text tools, pens and brushes, stamps, and erasers; just about all the tools you'd expect, all nicely organized on a tool palette you can position anywhere on your screen. The Cocooner is a special editing mode that allows you to perform non-destructive edits that are then used to create a new version of the image you're working on, leaving the original untouched. The Cocooner works by creating a data file that contains the edits that will be applied to an image. When you're happy with the results, click the Export button, and a new version of the image will be created, leaving both the untouched original and the modified version present in the same folder. Cocooning is a nifty idea, but at the moment it seems half-baked. Very few of the normal editing features are supported in the Cocooner environment. Once Lemke Software fleshes out this feature with more editing capabilities, it should prove a worthwhile feature. Converting remains the strong point of GraphicConverter, with support for the largest number of image file formats in one app that I've ever seen. While you can use the Save As command to convert the image you're currently viewing into a different graphic image format, the much more powerful Convert and Modify command allows you to select one or more images, or entire folders, to batch process all at the same time. GraphicConverter belongs in every photographer's bag of tricks. It can perform just about any type of conversion you can think of, has a very usable image browser, and an image editor that can take care of routine editing needs. It can also automate a wide range of routine image manipulation that, frankly, can be boring to perform, so why not let GraphicConverter take care of the routine stuff for you?